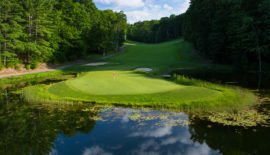 AUBURN HILLS, Michigan — The ball sails high through the cold January air, the perfect trajectory, the perfect line, hitting smack-dab in the center ring by the flagstick, 185 yards away. This is the future of the game. And I’m completely hooked. If you’re one of the few people who’ve never heard of Topgolf, Topgolf spokesperson Caroline Jerome sums up the concept nicely. Since its humble days on dusty British driving ranges, the Topgolf empire has exploded to more than 50 locations in the U.S., U.K. and Australia. This Auburn Hills location is one of the newest, and the sold-out crowds practically line out the door of the massive, 65,000-square-foot facility. One Saturday night in January the wait time for a hitting bay was a laughable five hours. Like everywhere else Topgolf has been, the crowd is squarely set in the coveted 18-34 demographic marketers everywhere salivate over. How? Why? The “secret sauce” to Topgolf really boils down to this: It’s an absolute riot. Like some kind of cyberpunk sports fantasy, Topgolf offers tons of modern architecture, entertainment options, and neon. 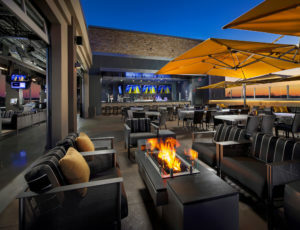 With most players staying at Topgolf for two hours, with plenty of music, food and drink and comfortable couches to lounge on, cool bars and dozens of TVs everywhere you look, Topgolf is golf’s cooler cousin. 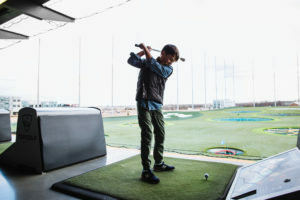 Topgolf succeeds by improving on all the sticking points for the game of golf itself — namely, that it’s too hard, too time-intensive and too expensive. 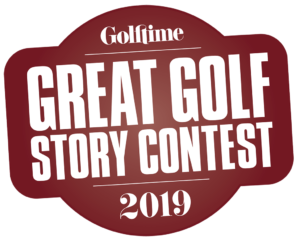 The result is a game that transcends the traditional sport, one that attracts and appeals to the masses in ways golf itself has struggled to do in recent years. 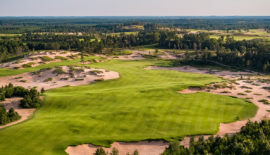 A casual glance around the Auburn Hills facility confirms this, with groups of friends, couples, and clearly non-golfers dominating the clientele this visit. Topgolf is affiliated with Callaway Golf, and provides clubs at every bay, or players can bring their own bags, too (most don’t). And while purists might scoff at the idea of Topgolf providing a path to greater participation for the game itself, the proof is pretty clear in some National Golf Foundation statistics. The NGF’s 2017 study found that not only is Topgolf driving players to the game, but a whopping 23 percent of all new players got their first experience with the game at a Topgolf. And a full 75 percent of non-golfing Topgolf players said they wanted to try the sport on a real course after playing Topgolf. Additionally, according to the NGF, the number of people who played on a golf course for the first time in 2017 increased for the fourth straight year. Add those stunning stats to Topgolf’s treasure-trove of Millennials (70 percent of its 12.75 million players in 2017 were 35 or younger), and you can see why the game’s top brass is positively giddy over the game’s cooler cousin. Topgolf’s fare makes it not just the best driving range you’ve been to, but maybe the best bar, too. But Topgolf’s growth is far from limited to the golf courses themselves. 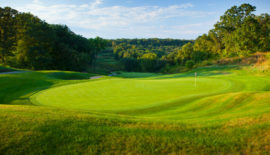 The brand is growing in seemingly every direction, from the multimedia (including cooking, music, variety and the Topgolf Tour shows on its Youtube channel), as well as apps and other avenues to get into the game. The Golf Channel even features Topgolf with its popular Shotmakers show. Topgolf’s Swing Suites are indoor Topgolf simulators designed with the full experience in mind, which the Toptracer retrofits existing driving ranges with aspects of the Topgolf technology and gameplay. 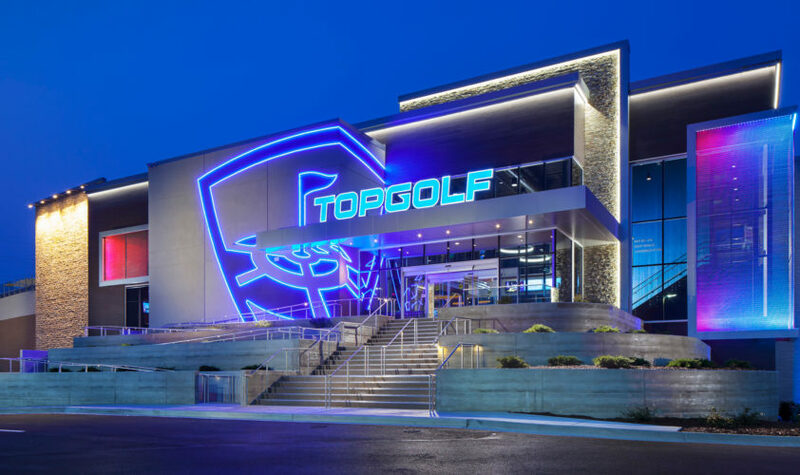 Like every successful business, maybe the best indicator of Topgolf’s growing success — besides the nearly 13 million visitors in 2017 alone — is the number of imitators that have sprung up to challenge its market share. 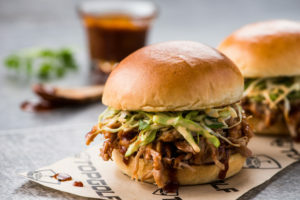 The past few years have seen the massive Drive Shack open in Orlando, with five more locations planned by 2020, and the Jack Nicklaus-affiliated The Flying Tee open in Oklahoma, and more on the way. With all that in mind, don’t look for Topgolf to take its foot off the gas just yet, Jerome says. Topgolf is having an enormous impact on growing the game, with youth programs and instruction, too. Whatever the future brings for the company, it’s clear golf’s future is a little brighter thanks to Topgolf’s irresistible neon glow. 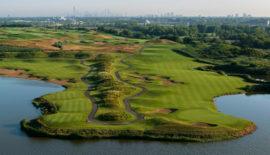 For more information, visit topgolf.com.